So it is that Sylvester is a messenger of the peace which Christ came to give to the world, of which the Angels sang on Christmas Night. He is the friend of Constantine; he confirms the Council of Nicaea; he organizes the discipline of the Church for the new era in which she is now entering; the era of peace. His predecessors in the See of Peter imagined Jesus in His sufferings; Sylvester represented Jesus in His triumph. Sylvester’s feast during this Octave reminds us that the Divine Child who lies wrapped in swaddling-clothes, and is the object of Herod’s persecution, is, notwithstanding all these humiliations, the Prince of Peace, the Father of the world to come. In this beautiful commentary by D. Guéranger. The example of St. Sylvester is quite opportune for the sad days in which we live. He was the Pope who lived in the time of Constantine and, therefore, presided over the transformation through which the Church passed. She was in the darkness of night and came to live in the full light of the sun; she was persecuted as a slave and became the Queen; she left the catacombs and began to dwell in the palaces. Under St. Sylvester’s inspiration and command, the great work began of building the Church as an institution, as a sovereign religious society, the work which some call the “constantinization” of the Church. 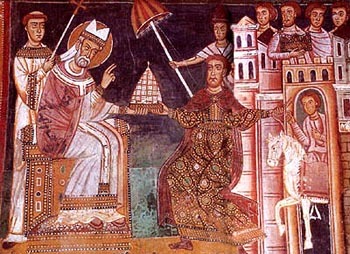 Above, Constantine offers a tiara to Pope Sylvester. The progressivists created the term “Constantinian Church,” and from the adjective “constantinian” other words came, such as “constantinization,” “de-constantinization,” and even the verb “to constantinize.” What do the progressivists mean by these neologisms? First, Emperor Constantine made a decree giving liberty to the Catholic Church; then he issued another decree forbidding the false cults to carry on openly. Second, wanting to repair for the unjust persecution the Church had undergone, Constantine gave his mother-in-law’s palace to the Church. This was the palace of the Laterani, and it became the first basilica of the Pope. It is the Basilica of St. John Lateran. 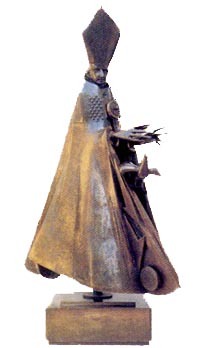 Third, he began to bestow special honors on the Bishops and treat them as official representatives of the Church. 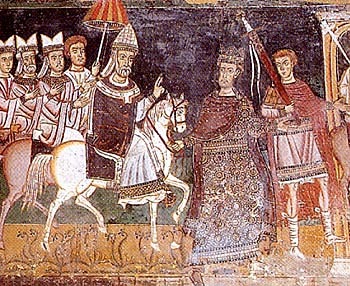 Fourth, the acts of Catholic worship became more solemn because Constantine’s presence at such ceremonies lent them the prestige of the Empire. Fifth, he considered the Church to be united to the State. In the political sphere, it pronounced the Catholic Church as the only true Church. As such, the Church deserves to be protected, supported, and respected by the State. Therefore, the Church is an entity more noble than the State and, at depth, given the fact that she is divine, more important than the State. From this principle came the medieval metaphor that the Church is like the sun, and the State like the moon that turns around the sun and depends on it. In the religious sphere, it manifested that the most splendid and magnificent earthly things and most beautiful works of art were made first and foremost for the worship of God. So, man should make and reserve the most magnificent incenses, the purest gold and silver, the most splendid fabrics and clothing for the service of God. This is the concept behind the “Constantinian Church.” Thus, the term circulated by the progressivists is in a certain sense objective, and we can understand it as standing for the temporal character of the Church, with her correlated richness and solemnity in worship, her sacral buildings, the pomp of her dignitaries, etc. So, on one hand, we have the progressivists attacking the “Constantinian Church,” and on the other, we have us defending it. When St. Mary Magdalene used a splendid perfume to wash the feet of Our Lord and dry them with her hair, the first seed of the splendor of the future worship of Jesus Christ was sown. When Judas revolted against such an act, saying that the perfume was too expensive and should be sold and the money given to the poor, he also was planting a seed, the seed of the progressivist position, which hates the solemn and rich worship. 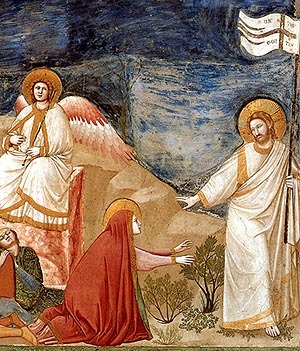 Notwithstanding, Our Lord argued against Judas by saying that we will always have the poor with us, and He defended the position of Mary Magdalene. The position of the progressivists, therefore, is one that opposes temporal splendor for the Church. They call their ideal “miserablism” or the “miserablist Church.” According to this concept, the Church of Jesus is the church of the poor, a church made for the poor, and when she displays pomp and solemnity, she affronts the poor. Further, she should be not only poor, but also miserable; she should present herself in a kind of misery. Therefore, the religious edifices should resemble the most miserable abodes so that the poor do not feel uncomfortable in them. According to this mentality, Jesus Christ would have hated luxury and wealth; therefore, pomp, solemnity, and the use of rich objects should not exist in the house of God. Not only should poverty dominate in worship, but the Church should also be denied any special treatment, honor or protection from the State. She should be like any other society. The thinking behind this is clear: since the poor do not have wealth, luxury, and honors, then no one should have them, not even God. It is egalitarianism in its most monstrous aspect - because it goes further than demanding equality between poor and wealthy men, but calls for equality between the poor and God, which is absurd, since God is infinitely greater and more than all men, including the wealthy ones. This, then, is the thinking of the progressivists, which coincides with that of Judas Iscariot. Applying this thinking to the Church, the progressivist current promotes the auto-destruction of the Catholic Church. It also wants to extirpate all the veneration the different peoples pay to the Church, they would like to strip this from the very souls of the Catholic peoples. On our part, we should know and understand what the progressivists mean when they attack the Constantine Church, and then we should love the temporal characteristics they hate. Because throughout History this is how the Holy Catholic Church was, is, and will be. Temporal splendor is a necessary part of the one true Church of Jesus Christ. We should remember that the man who “constantinized” the Church was St. Sylvester, a Pope and a saint canonized by the Church. If a Pope of our days (1966) were to say that the Catholic Church should be “de-constantinized,” he would be doing the opposite of St. Sylvester. We can imagine the furor of St. Sylvester against such a Pope if he were to return to earth and witness what was happening to the work he initiated. This should also be our sentiment against these blasphemous despoilers of the One, Roman, Apostolic, Catholic Church.